3. Then click "User data"
• The users password is not displayed in this dialog, it is set by the user. 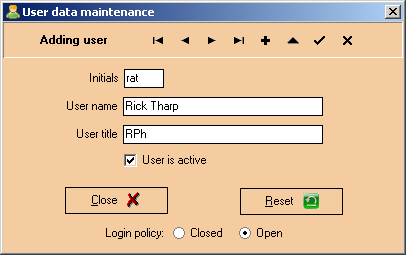 • If the log in is "closed", this dialog is the only means of entering a new user. The row of buttons along the top of the dialog are used to browse through the user database. • Contrast this to a "closed" log in policy which requires someone with knowledge of the database password to add new users. • To close the log in, select the "Closed" check box. If a user has lost or forgotten their password, it may be reset by this dialog. Click the Reset button to reset the user's password to blank. He or she then enters a new password at their next log in. To maintain data integrity, you cannot delete a user. If you need to inactivate a user, uncheck the "User is active" check box.